Leon County Schools is proud to announce the new Microsoft Office Pro Plus Program to students, parents and employees (*Note: Charter school students do not fall under this license). This program provides free access to Office 365 Pro Plus for students enrolled in school districts and employees of school districts that purchase enterprise-level licenses. Leon County Schools meets this requirement! Who is Eligible for the Microsoft Student Advantage? Any student who is currently enrolled in the Leon County School District or active employee is eligible and may use Office 365, or download and install Office 2010 0r 2013 Pro applications on up to 5 devices (PC, MAC). For mobile devices, please visit the Mobile QR Downloads section to the left. (note: Office 2010/2013 can NOT be downloaded to Android or iOS devices). For help with retrieving your child's "student login", please contact your schools technology coordinator. How do Students Download Microsoft Office? Student's email will be structured as StudentID@edu.leonschools.net and will be entered where it says someone@example.com. Enter the student's email and password that was provided by your child's school. Click on "OFFICE 365" on the top left to make sure it is highlighted in blue. Check to ensure that you have available installations by looking at the computer name, operating system and installation dates. Remember: Each student only can install the software on 5 devices. Click on the drop-down menu and select the appropriate language. Once installation begins, the installation program will scan your computer for any previous versions of Microsoft Office. If you have Microsoft Office 2013 installed already, you will have to remove it from your system before continuing the installation. Once prompted, select the Fix It Button at the top of the screen to uninstall the program (Office 2013/Office 2010). Once complete you must reboot your computer and log in again and repeat steps 1-5. If you do not have to remove Office, your installation of Office 2013 ProPlus will begin. Once the application is loaded, a progress box will appear as the software downloads the final settings. Please note that the speed of your connection will determine the speed of this part of the installation. Once all loading is complete, follow the steps (wizard or online prompts) to personalize your Office 2013 ProPlus and begin using your software. For assistance please email our Help Desk at helpdesk@leonschools.net or call 850.487.7524 during normal school hours. » I'm a student at a charter school which is a school in Leon county so I qualify right? We are sorry, but the license agreement only allows students who attend a Leon County Schools operated school to have access to the O365 downloads. » Office 365 and Office 2013 are the same thing right? › O365 is a 100% cloud/browser based system and does not have to be installed (it is not downloaded). This is a new way of working with software where you are basically streaming the software over the web. › Office 2010 or Office 2013 is downloaded to your local machine through O365 and allows up to 5 copies to be downloaded for use by users. This is the normal way users have used office in the past and is the full featured version. » I can install Office 2013 on my Ipad, Iphone, Android or tablet right? No. Tablets and phones are not designed to rull the full desktop version of the software. 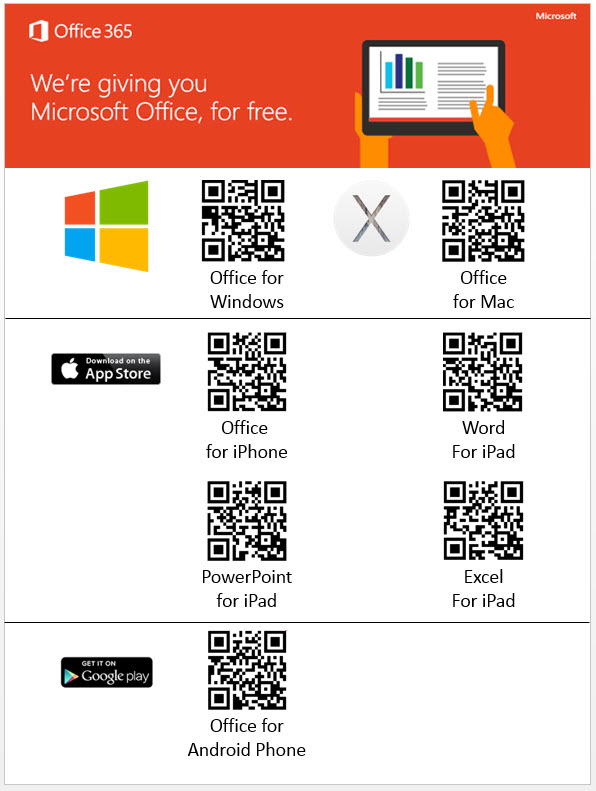 If you want to install the office suite on mobile devices, please visit the Mobile QR downloads section on the left and follow the links there to access and download the mobile apps for your device or log in here and run Office 365 from your browser. » Is there a support site for Office 365 ? » I tried using my Hotmail, MSN, or Outlook acct, but its not working. What now? › If you own a Windows 8 machine @ home, you probably created a personal MSN, Hotmail, or Outlook acct to enable the Microsoft store. Those credentials belong to you and is your "public" acct, and remains yours forever. However, attempting to use your personal (public) acct credentials within our private O365 system will not work and will not allow you to access Office365, or to download and use Office 2013.. NOTE: If you access the MS Store and download the Office suite using your personal MS crednetials, your LCs credentials will not activate that software. » Who do I contact for assistance? » What happens when a student leaves the Leon County School District? Once a student leaves the school district, the Microsoft Office ProPlus subscription ends. » Can I install the software on more than one device? Microsoft Office Pro Plus can be installed on up to 5 devices. » Do I have to delete software from my computer to add Office 365 Pro Plus? » What applications are available in Office 365 Pro Plus? » What are the PC requirements for Office 365 ProPlus? » What are the Mac requirements for Office 365 ProPlus? » What are the iPhone requirements for Office Mobile for iPhone? » What are the Android requirements for Office Mobile for Android? » Where can I get training on Office 365 ProPlus?